Best Approach Shoes: How to Choose the Right Pair? You have to agree with us that when you’re scrambling over tiny slippery rocks or traversing across smooth slabs, a slip and fall is very likely could be very dangerous. 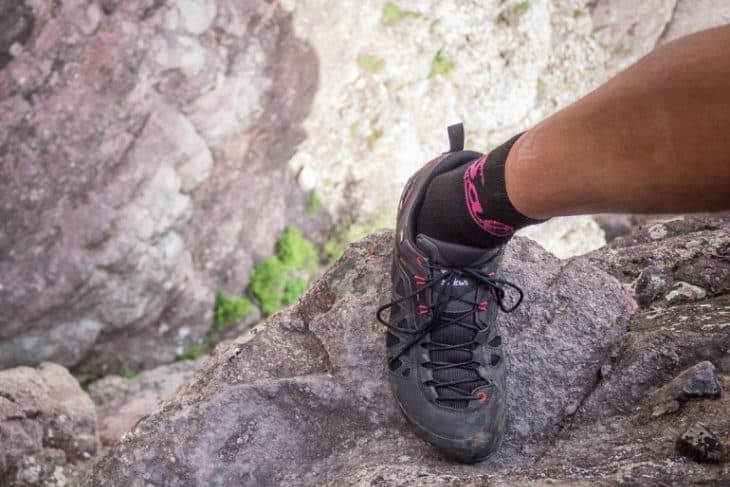 Climbing approaches typically have exposed rocky terrain that can be slippery and dangerous, and approach shoes provide the confidence that your feet will stay in place when you plant them. That’s why you need the security of the best approach shoes. With the right pair you can feel comfortable on that next trip, and that means a much safer and more fun trip. So how do you know if you need an approach shoe for your next climbing trip? Easy. 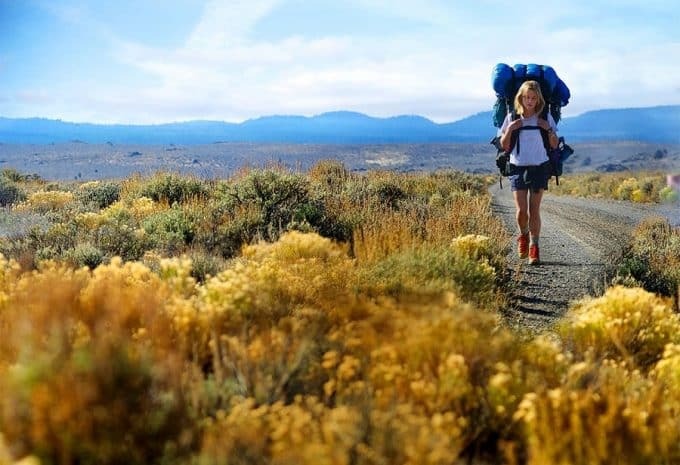 In this article, you’ll find out how to chose the right model for you and what to keep an eye on, and you will have a chance to read reviews of the best shoes for your next trip, without having to spend a lot of time on the research yourself. 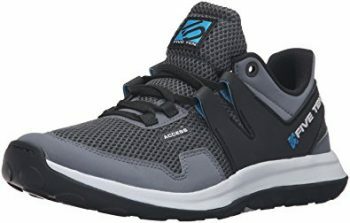 There are many features to consider before purchasing approach shoes. Most importantly, they must have sticky soles and provide durability, but there are a lot of other features that make an approach shoe more safe and comfortable. Here are our recommendations for choosing an approach shoe with the most appropriate features for your specific needs. When you’re trying to keep your feet firmly planted on slippery rocks, you don’t want the added hassle of lugging around heavy shoes on your feet. Make sure to check the weight of approach shoes you are considering purchasing and try them on to see if they feel heavy or not. Always choose the most lightweight approach shoe possible, but make sure its other features suit your needs as well. 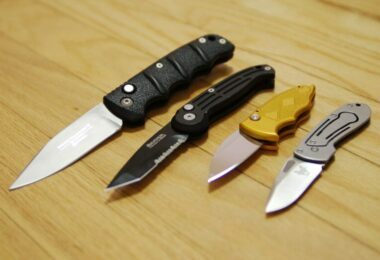 If you have to choose between lighter weight and better grip you want to look at the shoes carefully. 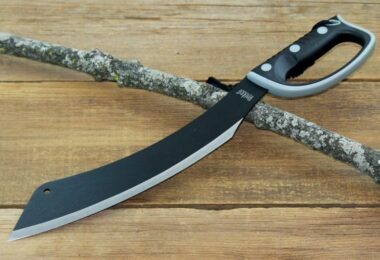 There will be some tradeoff in this area, because you can always slow down to accommodate the added weight but there’s not much you can do if you don’t have the grip that you really need. Durability is essential in an approach shoe. After all, you’ll be trekking them across rocky terrain and beating them up on the edges of rocky mountains so make sure they’re durable enough to last you more than a couple of months or climbs. Think of durability in the same way as running shoes. They should last you about six months if you’re using them frequently. However, if you only go climbing on occasion, it’s ok if approach shoes last you a year or longer. Don’t spend a fortune on shoes that promise to last forever (unless they come with a replacement guarantee) because you’re going to be wasting your money. Your shoes aren’t meant to last longer than about six months because of the level of strain you’re putting on them, but that doesn’t mean you shouldn’t pay for quality still. A good approach shoe has a sticky rubber sole to help provide friction between your shoes and the rocky terrain for a sturdier grip that won’t let your feet slide all over the place. The purpose of approach shoes is to provide a safe shoe for getting you to your climbing point. This means they have to be sticky enough to prevent you from any unwanted falls. Make sure you test these shoes on the less intense terrain before you try trusting them with something more important. You want to know that you’ll be able to trust them long before you end up on the side of a cliff uncertain if you can make it all the way where you want to be. If the shoes can’t make it on flatter terrain they’re definitely not going to work on anything steep. The fit of an approach shoe depends what you’ll be using them for. If your approaches are long then you don’t want your shoes to fit too snugly or they’ll make your feet hurt; ideally they should fit like a hiking shoe. On the other hand, if you’ll be traversing across difficult and slippery terrain, you want your approach shoes to have a tighter fit for better stability. 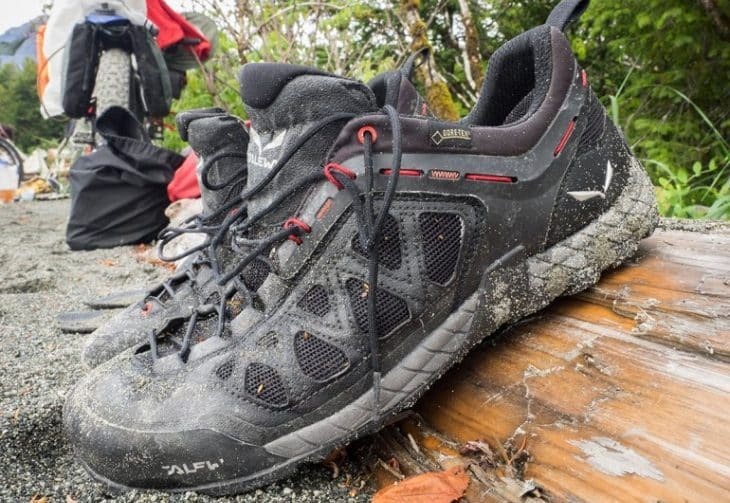 No matter what type of terrain you’re on you want to make sure the shoes feel comfortable and that you’re going to be okay wearing them for an extended period of time. They shouldn’t be so tight or so loose that you get blisters on your feet from rubbing as you walk. Comfort is a big factor for choosing an approach shoe. 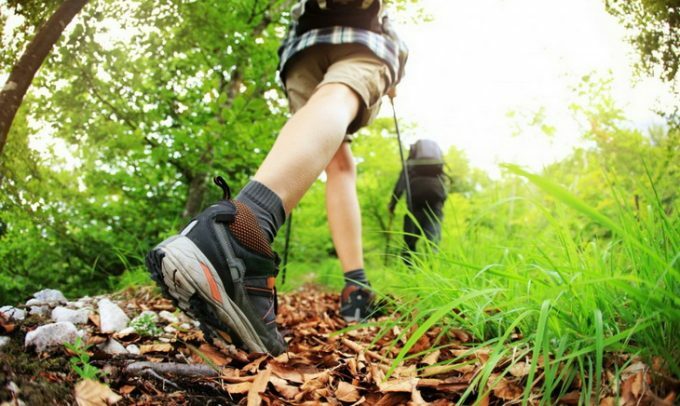 If you’ll be hiking long distances across rough terrain, then you want your shoes to absorb some of that shock. Choose approach shoes with good cushioning and breathability for optimal comfort. Look for added features like insoles or additional padding for comfort. For breathability, mesh approach shoes are ideal, especially in warmer weather. Again, this depends on the kinds of approaches you usually hike, but don’t neglect the comfort features, or you’ll regret it later. Plan for several different weather conditions so you’re ready for whatever comes your way. As we discussed earlier, approach shoes are for your “approach” to a climbing point. This means that once it’s time to start your climb you’ll be changing into different shoes. 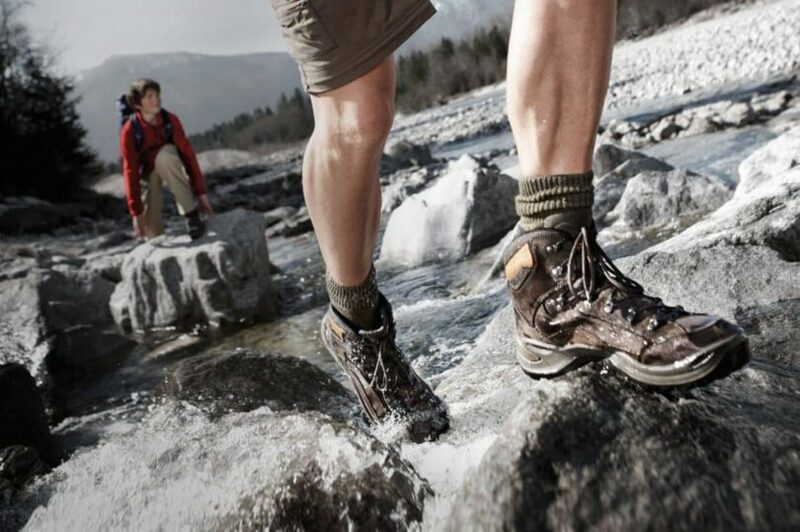 When you’re changing shoes on rocky edges and rough terrain, it’s best to have shoes that are easy to take on and off. Practice putting the shoes on and taking them off on flat terrain and get an idea of how simple that is, then consider how they’ll work on something steep or rough. If you can’t get them on and off easily while you’re in your own home or somewhere else you feel comfortable you’re definitely not going to want those shoes for your approach. This last feature to consider is not a necessity, but it’s definitely an added benefit. Even if you don’t typically hike in wet conditions, the weather is unpredictable and it’s best to be prepared, especially in the mountains where the rain starts at a moment’s notice. Make sure to check whether your approach shoes are water resistant or waterproof before you purchase a pair. Water resistant shoes are good for light rain or if you walk through the damp grass. Waterproof shoes are going to be good if you tend to walk through harder rain or even puddles and streams. Make sure you consider your typical hikes and your potential future hikes before you decide which one works for you. When you look at the different products that are available to you, these are the things you want to look at so you have a better idea of what you’re getting and how it’s going to work for you. Something that seems minor today could be a huge issue when you find yourself out there on the hike, so consider that as well, when you know what you’re looking at. There are plenty of approach shoes out there on the market, of course, but you’re definitely going to want the best (and you’re not going to want to look at all of them). That’s why we’ve found some that are going to help you get that ideal approach without breaking your budget. Specific features: Stealth rubber sole, vegan-friendly construction, mesh lining for breathability, water resistant. 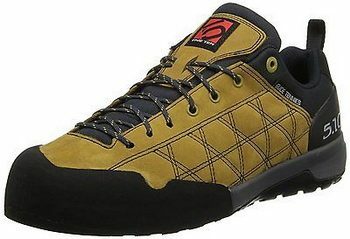 Best use: Tennie’s canvas approach shoes are best used for mountain biking and rock climbing offering an easy approach shoe to take on and off when changing into climbing shoes. Description: These Five Ten Guide Approach Shoes are a leader in approach shoe performance, providing high-friction shoes with a synthetic stealth C4 rubber sole that combines with a mesh lining to maximize breathability, cushioning, and durability. 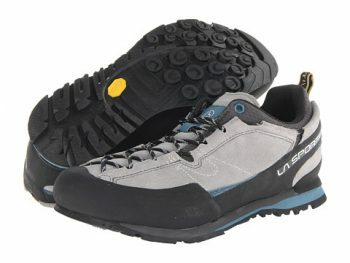 They are the perfect shoes for all of your outdoor mountain and rock climbing sports. These shoes also offer vegan-friendly construction with a canvas that is resistant to mud and water and easy to take on and off for changing into your climbing shoes. They have plenty of padding through the tongue and collar to increase your ability to wear them for an extended period and they have several different color options as well as any size you may need. Compression molded outsoles and uppers ensure they fit right to your foot for the entire trip and the C4 material means that it sticks no matter what you’re hiking on. If you’re not hiking or mountain climbing for extended periods you can use them for things like mountain biking as well. Related: You can never have too many carabiners with you when you’re hiking and this Petzl Pro Attache Carabiner is definitely one you’ll want to take a look at as it can hold plenty of weight and keep you climbing safely, no matter where you go. Specific features: Sticky grip approach, rubber sole absorbs shock, waterproof, lacing system offering adaptable fit. Best use: This approach shoe is best used for rigid and extreme rocky terrain. With the stickiest approach compound on the market and a durable rubber sole for absorbing shock, these shoes provide a tough rigidity for holding edges on tough climbs. Description: The La Sportiva Boulder X approach shoe offers a synthetic vibram-idro grip approach compound, the stickiest approach compound on the market. This ensures that you’ll be comfortable coming up to just about anything. The highly durable rubber sole also absorbs shock and energy and is coupled with a high cushion and resilient layer to keep water out, even when you’re walking through it. The polypropylene insole cushions the foot for comfort on long approaches and the Mythos lacing system provides for a highly adaptable fit for all foot types. It stays stiff and rigid no matter what because the construction method and materials. Not only that, but the sticky and durable rubber sole stays sticky even on wet rocks, making this the perfect approach shoe for providing deluxe comfort and performance. It comes in several different color and pattern options as well as just about any size you could need, though it’s measured in European sizes. It has a proprietary outsole technology called Impact Brake System, which provides variegated lugs and increases your braking power by about 20%, important when you’re on a steep or rough surface. Related: The Julbo Explorer Mountaineering Sunglasses are ideal if you’ll be hiking and climbing in areas with colder temps and steep mountains. If you’re in the glaciers and such, they’ll keep you from injuring your eyes as a result of the strong sunlight and reflections and that helps you keep climbing a whole lot longer. Specific features: Protective abrasion resistance, Gore-Tex comfort lining, extraordinary grip. Best use: This is a great approach shoe for beginners who don’t have a lot of time to break in new approach shoes. With a midsole boost, these offer high energy and adaptability for rocky mountain surfaces. Description: Adidas offers a great approach shoe in the Adidas Terrex Agravic model with a synthetic sole and midsole boost that offers endless energy on mountains and high adaptability to rocky surfaces. With an abrasion resistant outside layer for protection and a Gore-Tex lining, these are the ultimate shoes for approach comfort made even better by an outsole made of continental rubber. This provides an extraordinary grip from the lug pattern inspired by mountain bike tires. The shoes come in a range of different color options so you can showcase your individual style and they have a 5.5mm lug height that keeps you balanced and steady on even extremely rough terrain. 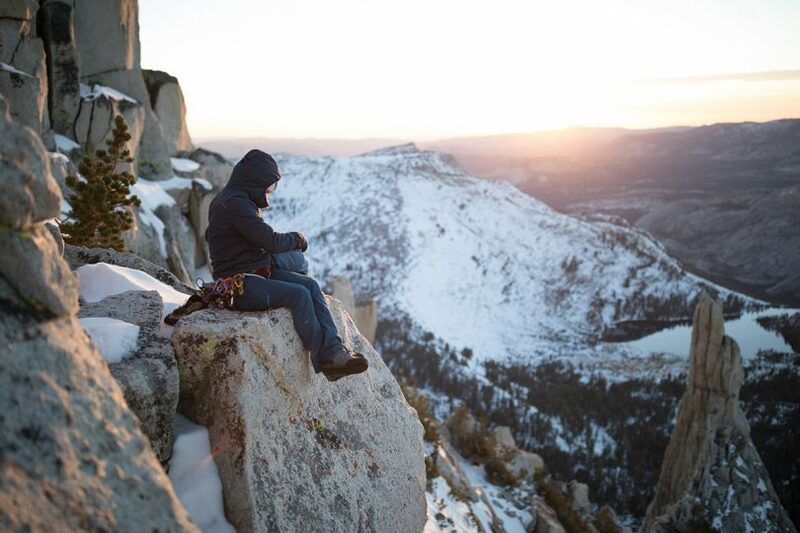 That way, you don’t have to worry about anything when you’re hiking in moderate conditions or extreme conditions. These shoes are able to stand up to all of it and keep you on your toes the entire time. Furthermore, their moderate weight and ideally sized and designed for women with a breathable tongue and membrane as well as being waterproof so you can wear them comfortably even walking through the water or in wet areas. Ideal for moderate terrain, these are shoes that can get you started on extended and rough hikes and trips. Related: If you’re going to be trekking a lot, then these Black Diamond Trekking Poles can be a great option. They are made with carbon fiber for durability and have plenty of adjustability at the same time. All of this means you should be more than comfortable walking anywhere that you want to go. Specific features: Leather, lightweight, adaptive fit liner, air permeable, barefoot comfort. 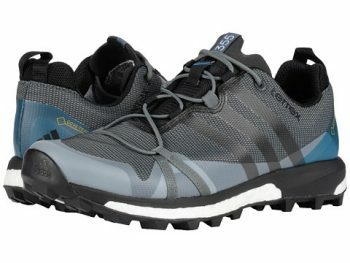 Best use: These are best used for mountain climbers who appreciate a lightweight shoe and are optimal for summer use thanks to their air permeable liner. Description: This imported Arc’teryx Arakys approach shoe is perfect for routes that where you really need the lightest approach possible. Optimized for agility and traction with the reduced weight and volume construction, the adaptive fit liner is air permeable to provide summer comfort and breathability. 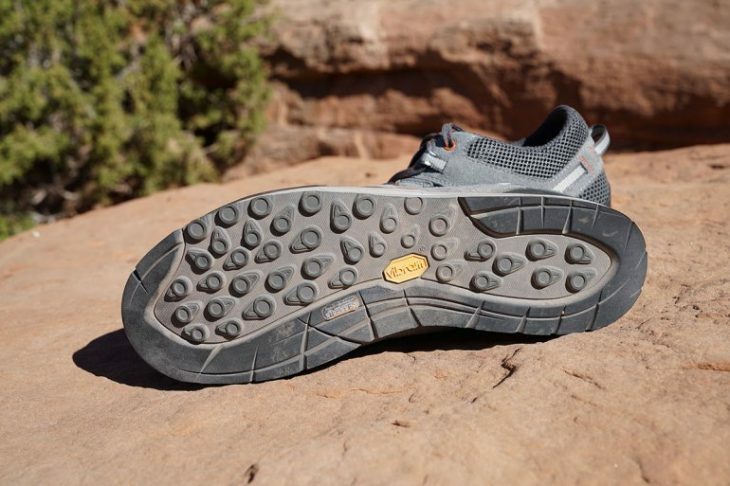 This means you’ll be able to go wherever you want and hike whenever you want as well.The sole is configured for different approaches and descents on technical rock with a leather foot bed that provides barefoot comfort and a highly durable foam midsole for absorbing shock. 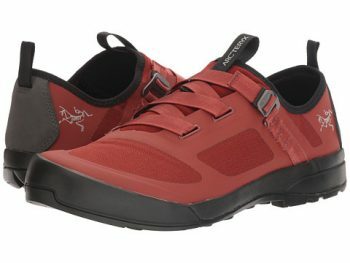 Arcteryx offers this approach shoe with a memory buckle for secure one-hand closure making it a cinch to engage and release compared to other approach shoes when it’s time to change into climbing shoes. Available in several different colors for your own personal style, these shoes have a laminated heel and toe for a secure fit and the thermolaminated construction is also extremely abrasion resistant, making them very durable shoes. They have water resistant rubber compound for stickiness so you don’t have to worry about slipping even on wet rocks. Related: Also by Arcteryx is the Conveyer Belt, which comes in several different colors and provides you with all of the features you could want in a belt, especially when you’re going to be outdoors. 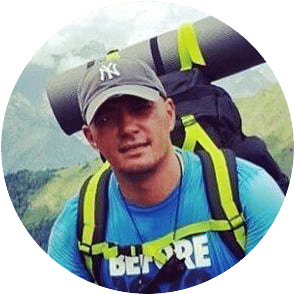 It works well for everyday as well as hiking and travel because of the strength and thickness overall. Specific features: Stealth rubber outsole, durability for technical edging, toe cap protection, extremely lightweight. Best use: These mesh approach shoes are ideal for approaches that require lightweight shoes for technical edging and a protective fit. With several protective features combined with the mesh design for reducing weight, you won’t find a better technical approach shoe. Description: This Five Ten Access Mesh approach shoe comes with a synthetic imported rubber sole, stealth rubber outsole, and climbing zone toe for added durability and technical edging. The rubberized exoskeleton lacing system offers added torsional support with reinforced toe cap protection. With a lightweight midsole and higher rubber content for increasing shock absorption and durability, this approach shoe provides the ultimate technical fit. Comfortable to wear, for an extended period, these shoes provide you with a moderate amount of arch support and plenty of stickiness no matter where you’re going. It runs not only through the center of the sole, but also through the toe as well, so you’re always going to be comfortable climbing, no matter which part of your shoe actually gets onto the rocks. There is mesh on the top of these shoes, which means they’re not great for the coldest of temperatures, but they are great for warm weather hiking and climbing. They are very light shoes, which can be great for those who are trying to stay as light as possible, but can be a bit too much for some others. Related: If you do hike and climb you’ll probably find cuts and scrapes over time, at least once in a while. The Climb On Mini Bar is great for this because it’s 100% pure and organic and works on basically any kind of skin problem you can have and anywhere you might have it. It’s great for keeping your skin in great shape, all the time. Specific features: Leather, sticky rubber sole, comfortable suede upper, dual-density sole, European quality. Best use: With suede upper for reducing break-in time and a rubber toe for abrasion resistance, these are the perfect approach shoes for new climbers. Description: The Scarpa Gecko offers European quality and ultimate climbing shoe performance with a leather imported synthetic sole. The sticky rubber sole provides excellent grip and the suede upper reduces break-in time for durability and comfort. With a lace-to-toe design and dual-density sole, coupled with a rubber toe for excellent abrasion resistance, these approach shoes provide a vital performance fit for climbers new and experienced. Though slightly more expensive than many of the other shoes on this list, these ones are made primarily with suede for a sturdy exterior and also provide a stylish look if you choose to wear them elsewhere. They feature contrasting colors to even enhance this further. They have a lower break-in time because of the suede and still provide all the strength that you’re looking for. Tough lugs work well in tricky situations, including rough or slippery terrain where other shoes may fail. These are moderate weight and have a good blend of hiking capability and climbing ability. They even work well for climbing up mountains and hills. Though they fit slightly large, they are a good overall fit and compare with just about any other shoe you would get for the price. 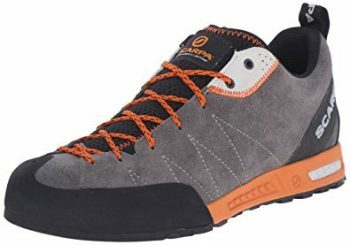 Related: If you’re looking for a slightly less expensive shoe from this brand the Scarpa Crux Approach Shoe is another great choice. It comes in several different colors and styles as well as plenty of sizes and is made with leather and textile as well as footweb and rubber to help get a good grip wherever you go. Specific features: Synthetic sole, dual-density foam foot bed, designed for speed, comfort of an athletic shoe. Best use: These approach shoes are best used for climbers who enjoy a variety of terrains and are looking for ultimate comfort. 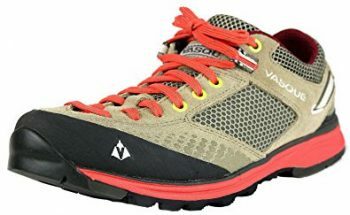 Description: This Vasque Grand Traverse hiking shoe offers an approach shoe with a synthetic, imported, Vibram sole, dual-density foam foot bed, and molded foam midsole. Designed for speed no matter what type of terrain you want to travel, this approach shoe provides the comfort of an athletic shoe with the performance of an approach boot. Feel prepared for any terrain with this functional, innovative, and aesthetic approach shoe option. Available in three different colors, these shoes are one of the least expensive, but still provide a great experience for anyone who likes to go hiking. They have plenty of ventilation to help you feel comfortable when you’re walking through hot climates, but are also water resistant, in case you find yourself stuck somewhere damp or having to walk through a little bit of rain. No matter what you’re walking on you’ll be able to get plenty of grip and that includes even loose stones that are usually very difficult to sink into in any way. Going up a little bit in size is a good idea because then you’ll be able to wear heavier socks if needed and get a little bit of space around your foot. Extremely lightweight for easy movement wherever you go. Related: The right socks can mean the difference between a great hike and a really bad one. These Mid Cushion Socks are ideal for any type of outdoor wear or activity and ensure you can feel comfortable doing whatever you want. Designed for women, they’re lower socks that still protect the ankle and are made with plenty of cotton and spandex for fit and comfort. There are a lot of approach shoes on the market making it difficult to decide which pair is right for you, but we’ve provided you with a list of our favorite options and advice for choosing the most appropriate features for your individual needs. Don’t forget the two most important features: sticky soles and durability. But consider other features like fit and technical climbing ability. 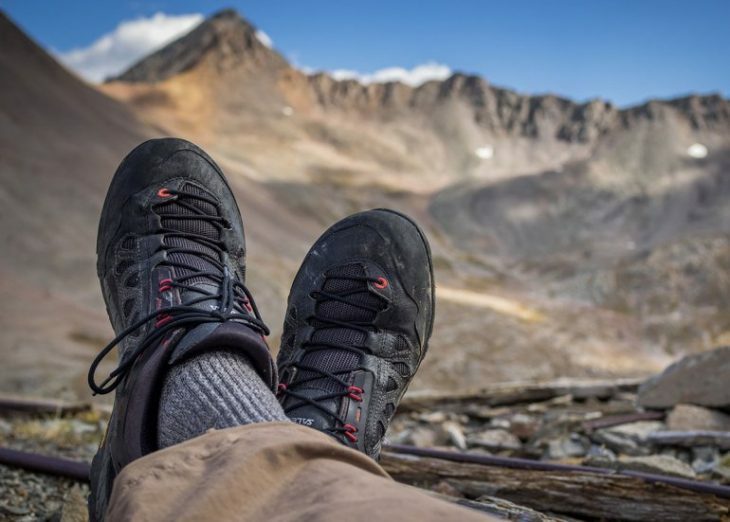 With the right pair of approach shoes you’ll feel confident hiking to your next mountain climb and know your feet will always land safely in place without fear of slipping or falling on dangerous terrain. Take a look at our overview on approach shoes and a list of products, and you’re sure to find the right fit for you. Do you think we missed any other great products? Do you have a different favorite that you think we should have included? We definitely want to know all about it.